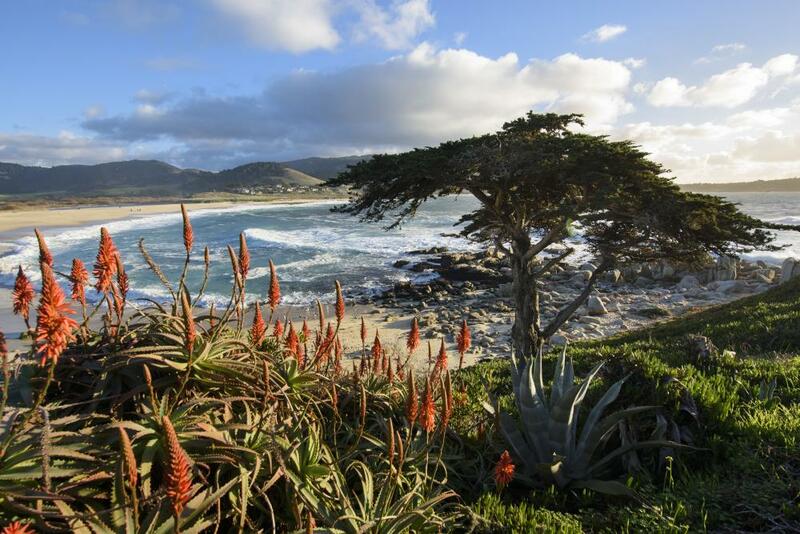 Celebrate the wonders of the seven seas by visiting one of Monterey County&apos;s seven beautiful beaches. You&apos;ll enjoy unspoiled nature, uncrowded sands and beautiful views. Please do your part to keep these beaches just as pristine when you leave. Click here to learn more about sustainable tips in the area including packing up your trash, sticking to marked trails and respecting local wildlife. You may very well have this beach to yourself when you visit. Well-hidden Zmudowski (pronounced "mud-OW-ski") State Beach is Moss Landing&apos;s best-kept secret. The convoluted route through agricultural fields means that many possible visitors turn around before they reach their destination. This beach, with rolling sand dunes and extensive white sand, is a prime fishing and birding location. To get to Zmudowski State Beach, take Highway One to northern Moss Landing. Head west on Struve Road, which goes through agricultural fields. Shortly after Struve Road turns left, take a right onto narrow Giberson Road. Giberson Road will turn left and right repeatedly as it goes through agricultural fields. Don&apos;t worry - you&apos;re not lost! In about two miles, you&apos;ll see the parking lot for Zmudowski State Beach. Carmel River State Beach is popular with divers, kayakers, and birders. Only a mile long, Carmel River State Beach includes the Carmel River Lagoon and Wetlands Natural Reserve, a popular birding area, and Monastery Beach, a popular diving area directly north of Point Lobos State Natural Reserve. Swimming is not recommended at Carmel River State Beach, as the water is known for its unpredictable riptides. To access from Monterey, utilize Highway 1 and head west on Rio Road (one mile south of Ocean Avenue). Turn left on Carmelo Street to access the parking lot. 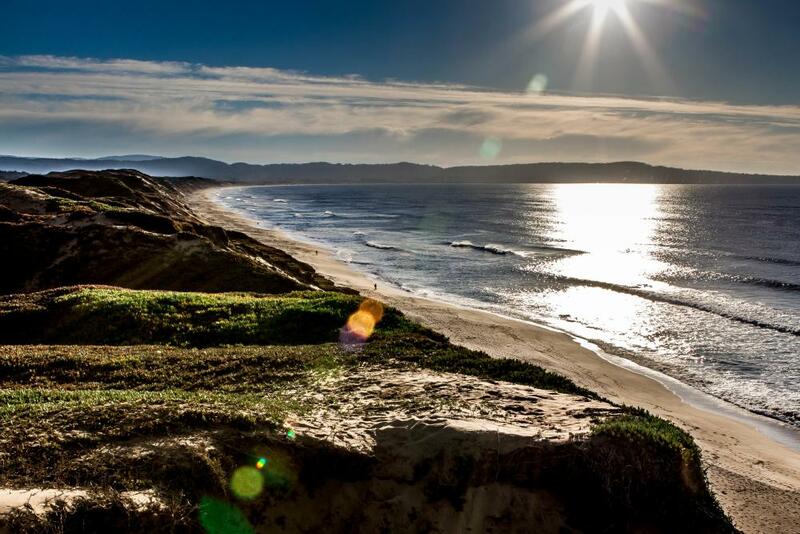 Monterey County&apos;s newest park, Fort Ord Dunes State Park, is known largely for its great biking routes. It also sports four miles of sparkling sands backed by tall beach dunes, all with breathtaking panoramic views of Monterey Bay. Hang gliders and parasailers glide overhead. For almost a century, only the military had access to this sweeping beach, but now it&apos;s open to all! To find Fort Ord Dunes State Park, exit Highway 1 at Lightfighter Drive and bear right. Turn left on 2nd Avenue, left on Divarty Street, right on First Avenue and follow signs to the parking lot. From the parking lot, follow the signs for the trail to the beach. 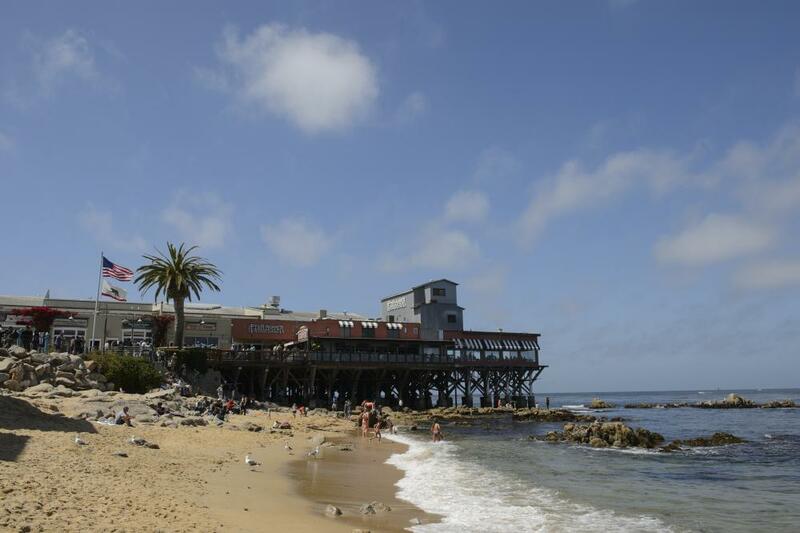 Did you know there&apos;s a beach in the middle of Cannery Row? Behind the Spindrift Inn lies the sheltered cove of McAbee Beach. In the 1850s, Portuguese whalers used this cove; in the early 1900s Chinese fishermen lived here. This secret beach is a great spot to let kids burn off energy before or after a trip to the Monterey Bay Aquarium. Visitors can spot seals and otters playing offshore and may see the occasional scuba diver emerging from the water. McAbee Beach has two sections, a small cove located at the foot of Prescott perfect for tidepooling and a much longer sandy beach at the foot of Hoffman, separated by a rocky area. At low tide, it&apos;s easy to walk from one end to the other; at high tide, it&apos;s best to walk along Cannery Row to get from the cove to the longer beach. Garrapata Beach, at Garrapata State Park, is a top spot for photography or just luxuriating on the sand. The rock formations at the edge of the water are fascinating; sunsets here are truly glorious. There&apos;s coves and at least one cave at the south end; during the wet months, there&apos;s a waterfall at the north end of the beach. To access Garrapata Beach, take Highway 1 about 8 miles south of Carmel. 1.4 miles south of Granite Canyon Bridge or 1.2 miles north of Rocky Point Restaurant, park by the side of the road. On the west side of Highway 1, you should see Gate 19. Follow the left fork of the trail, which meanders downhill and leads to a staircase down to Doud Creek. Walk alongside the creek to get to the beach. Please be sure to park safely and completely off of the roadway and use designated restrooms. Click here for more tips on traveling like an expert in Big Sur. 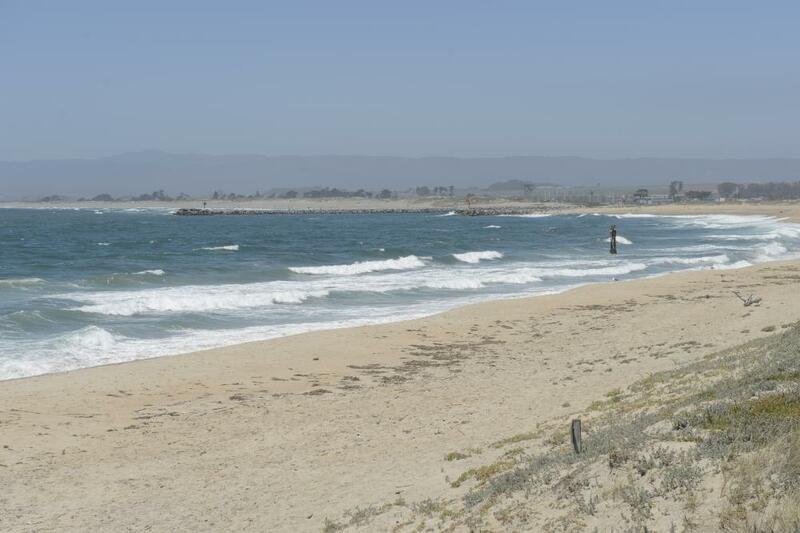 Salinas River State Beach combines perfect sands with the most unspoiled beach dunes on Monterey Bay. This hidden beach is well-loved by local nature fans. Birders love it for the many species that congregate in the adjacent slough. Photographers love it for the sweeping views of Monterey Bay and breathtaking sunsets. Surf fishers love it for the frequently biting striped bass and surfperch. To reach Salinas River State Beach, take Highway One to the Del Monte Blvd. exit just south of Moss Landing. Head west on Del Monte, which will soon become a dirt road. Follow the dirt road to the Salinas River State Beach and National Wildlife Refuge parking lot. This rocky beach, part of Julia Pfeiffer Burns State Park, is a favorite of scuba divers. The hike down to Partington Cove is about a half mile long and offers overhead views of Partington Creek as it tumbles in a series of crashing falls toward the ocean. As you near Partington Cove, you&apos;ll hear loud booms in the distance as ocean waves crash into underground caves. Follow the trail to the right along Partington Creek (now a babbling brook) down to beautiful Partington Cove. The rugged rocks, the miniature waterfall of Partington Creek&apos;s final tumble into the ocean, and the crashing wave are nature at its naked best. The Partington Cove trail is exactly 6 miles south of Nepenthe Restaurant or 2 miles north of the Julia Pfeiffer Burns State Park parking entrance. Find parking by the side of the highway near the metal gate on the ocean side of Highway 1. Behind the gate is a wide dirt trail (once a mule trail) that leads down to the cove. Please be sure to park safely and completely off of the roadway and use designated restrooms. Click here for more tips on traveling like an expert in Big Sur.